The Norwegian University of Science and Technology (Norwegian: Norges teknisk-naturvitenskapelige universitet, NTNU) is a public research university with campuses in the cities of Trondheim, Gjøvik, and Ålesund in Norway, and has become the largest university in Norway, following the university merger in 2016. NTNU has the main national responsibility for education and research in engineering and technology, originated from Norwegian Institute of Technology (NTH). In addition to engineering and natural sciences, the university offers higher education in other academic disciplines ranging from social sciences, the arts, medical and life sciences, teacher education, architecture and fine art. NTNU is well known for its close collaboration with industry, and particularly with its R&D partner SINTEF, which provided it with the biggest industrial link among all the technical universities in the world. The main building of Trondheim Technical College opened in 1898. NTH memorial stone (on July 22, 1906) is mortared into NTNU main building (Hovedbygningen). Prior to the merger, NTH, NLHT, DMF, and VM together constituted the University of Trondheim , which was a much looser organization. However, the university's root goes back to 1760, with the foundation of Det Trondhiemske Selskab (Trondheim Academy), which in 1767 became the Royal Norwegian Society of Sciences and Letters. The engineering education in Trondheim began with Trondhjems Tekniske Læreanstalt (Trondheim Technical College) in 1870, and in 1910, Norwegian Institute of Technology (NTH) opened officially. In 2010, NTNU celebrated the 250th anniversary of Trondheim Academy. NTNU also celebrated the 100th anniversary of NTH in the same year. The centennial was also celebrated by the publication of several books, among them a history of the university, entitled "Turbulens og tankekraft. Historien om NTNU"  which translates as "Turbulence and mindpower: The history of NTNU". Det Trondhiemske Selskab (Trondheim Academy), Norway's first academic society, was founded in 1760. In 1767, it changed its name to the Royal Norwegian Society of Science and Letters (DKNVS) upon receiving recognition from the Danish Crown. DKNVS library – today known as NTNU Gunnerus Library – was founded in 1768, and is Norway's oldest library. First proposal for a Norwegian Polytechnical Institute was made in 1833. Trondhjems Tekniske Læreanstalt (Trondheim Technical College) or TTL was founded in 1870. The newly formed school educated engineers of various fields. In 1898, TTL moved to a larger building in Munkegata. TTL was disbanded in 1900s, giving a way to a Norwegian Institute of Technology. In 1900, the Norwegian Parliament passed a resolution supporting the establishment of Norwegian Institute of Technology (NTH) in Trondheim. NTH was officially opened on September 15, 1910. Five academical departments were originally present in the parliament's resolution of 31 May 1900, such as Architecture and Urban Planning, Civil Engineering, Mechanical Engineering (a. General and b. Naval, i.e. ship and ship engine construction), Electrical engineering, and Chemistry (a. General and b. Electro-chemistry). In 1922, Norwegian College of Teaching in Trondheim (NLHT) opened at Lade gård. In 1950, Stiftelsen for industriell og teknisk forskning (Industrial and Technical Research Centre) or SINTEF was founded as part of NTH and as its link to Norwegian industry. University of Trondheim (UNiT) was established in 1968, and in Department of Medicine (later the Faculty of Medicine) established as part of UNiT in 1974. It was designed by the architect Henning Larsen. In 1984, NLHT also reformed into Norwegian College of General Sciences (AVH) as part of UNiT. 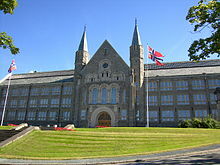 On 1 January 1996, the University of Trondheim became the Norwegian University of Science and Technology (NTNU). Already in 1989, NTH Rector Karsten Jakobsen had launched the idea of a Norwegian University of Science and Technology in Trondheim. On March 21, 1995, the Parliament, with barely a majority after a long debate, decided to establish NTNU in Trondheim. In 2014, the Norwegian Ministry of Education and Research asked the country's universities and university colleges to provide suggestions, observations, and ideas for restructuring Norway's institutions of higher education. The context of the request was that the Norwegian government wanted to cut back on the number of institutions in the sector. The NTNU board decided on 28 January 2015 to merge NTNU with the University Colleges of Sør-Trøndelag, Ålesund and Gjøvik to form a new university that would retain the university's current name, Norwegian University of Science and Technology. The merger, which went into effect in January 2016, made NTNU Norway's largest single university. NTNU has several campuses in Trondheim; Gløshaugen - for engineering and natural sciences - and Dragvoll - for human sciences and social sciences - are the main two campuses. Other campuses include Tyholt for marine technology, Øya for medicine, Kalvskinnet for archaeology, Midtbyen for the music conservatory and Nedre Elvehavn for the art academy. NTNU Gløshaugen is an artistic combination of historical NTH buildings and modern buildings. SINTEF, since its establishment in 1950, has its main departments at Gløshaugen. SINTEF was originally founded by NTH, but since 1980 it has been an independent research institute. In 1998, the Paper and Fiber Institute (PFI), an independent research institute, moved into a new building at Gløshaugen, relocating from Gaustad in Oslo. In April 2013, the Norwegian Institute for Nature Research (NINA) moved into a new building south of the Natural Science building. NINA has a lot of collaboration with SINTEF and NTNU. NTNU has long considered the possibility of bringing the activity of the two largest campuses together at or near NTNU Gløshaugen campus. In 2013, the Rector initiated a vision project, charges with defining different perspectives on future development in a 50-year perspective. The same year, 2013, the Norwegian Ministry of Education and Research initiated a choice of concept study for the future co-localization of NTNU's two main campuses in Trondheim. The reports were presented in 2014, and both recommended bringing Dragvoll and Gløshaugen together, and better integrating them with the city. A unanimous NTNU board endorsed the recommendations in the vision report. On 1 January 2016, the merger between NTNU and the colleges in Gjøvik, Ålesund, and Sør-Trøndelag officially entered into force, and NTNU gained campuses in Ålesund and Gjøvik, as well as in Trondheim. 2016 was also a transitional year in terms of NTNU's leadership. On November 24, 2015, the new Board met for the first time. It was then extended to include board members from each of the three merging colleges and an external representative appointed by the Ministry of Education. NTNU is governed by a board of 11 members, in accordance with the provisions of the Norwegian Act relating to universities and university colleges. Two of the members are elected by and from the students. NTNU's overall budget in 2017 was 8,19 billion NOK, most of which came from the Norwegian Ministry of Education. The college bridge (Høyskolebrua) connecting Campus Gløshaugen to Trondheim bakklandet. The bridge was constructed in 1927, designed by Sverre Pedersen. The Faculty is integrated with St. Olav's Hospital, Trondheim University Hospital, and is located in Campus Øya in Trondheim. Its main focus areas of research are translational research, medical technology and health surveys, biobanks and registers. The faculty has about 350 master’s degree students, 250 bachelor’s degree students, 720 medical students and more than 500 students attending other courses (2016 numbers). Ohma Electra was one of the first AC powered locomotives in the world (in operation from 1908 to 1950). It is now placed in front of the Old Electrical Engineering building. NTNU's history of research in engineering goes back to early 20th century, where the first Norway's electric railway, known as Thamshavn Line, was developed and constructed in Trondheim, as an AC powered tramway, with Trondheim-based technologies. The tramway was launched in 1908 and was in operation until 1974. Now, research is part of the ongoing activities at the NTNU Faculties as well as the University Museum. The university has 4377 scientific staff, that conduct research in more than 120 laboratories, and is at any time running more than 2,000 research projects. Students and staff can take advantage of roughly 300 research agreements or exchange programs with 58 institutions worldwide. NTNU has decided four Strategic Research Areas for the period 2014-2023, such as NTNU Energy, NTNU Health, NTNU Oceans and NTNU Sustainability, which were chosen on the basis of social relevance, professional quality and the potential for interdisciplinary cooperation. The university hosts six National Centres of Excellence (SFF), seven Centres for Research-based Innovation (SFI), and three Centres for Environment-friendly Energy Research (FME), which are mainly funded by The Research Council of Norway. NTNU is also co-organizing several centers with SINTEF. The fifteenth Kavli Institute was inaugurated at NTNU in 2007, as Kavli Institute for Systems Neuroscience, which was the fourth Kavli Institute in neuroscience in the world and the first Kavli Institute in Northern Europe. In 2012, Prime Minister Jens Stoltenberg opened the Norwegian Brain Centre as an outgrowth of NTNU's Kavli Institute  one of the largest research laboratories of its kind in the world. NTNU has funded the fundamental long-term research and infrastructure through three Enabling Technologies such as NTNU Biotechnology, NTNU Digital and Nano@NTNU. NTNU Research Excellence is an initiative to develop elite researchers and research groups in international class, which was launched in 2013, and includes established and new initiatives. The established initiatives are financed by the Research Council of Norway, the EU, and private-sectors (R&D), while the new initiatives are funded by NTNU's own funds in light of strategic prioritization of NTNU's resources. These cover a number of research funding schemes including Outstanding Academic Fellows Programme, Onsager Fellowship Programme, K.G. Jebsen Centres, EU projects, and ERC grants. NTNU participates in about 70 projects in the EU Horizon 2020 Framework Program. Gemini Centres: NTNU and SINTEF have established a wide range of Gemini Centres. Scientific groups with parallel interests coordinate their scientific efforts and jointly operate their resources. MARINTEK: MARINTEK has more than 70 years of experience in the developing of cost-effective, high-performance ships, where model testing in their laboratories constitutes an important element. It provides testing facilities, expertise, and analytical tools for developing operationally efficient and safe ship concepts. MARINTEK is located at the NTNU Department of Marine Technology, and has recently joined SINTEF Ocean. Rolls-Royce University Technology Centre: Rolls-Royce Marine, MARINTEK, and NTNU have had a close collaboration for more than 30 years, with cooperation in the development of propellers, propulsion systems, ship designs, and various ship equipment. The Rolls-Royce University Technology Centre is a long-term research collaboration between NTNU, MARINTEK and Rolls-Royce Marine, with a special focus on propellers and propulsion in waves and off-design conditions. NTNU NanoLab: NTNU NanoLab aims to facilitate a collaborative research environment for scientists within the fields of physics, chemistry, biology, electrical engineering, materials technology and medical research. The research activities are carried out in collaboration with SINTEF. SINTEF Energy Lab: SINTEF Energy Lab represents the next generation energy laboratories, and provide important tools for development of future energy solutions and power systems. It has a wide range of experimental facilities in different areas of Electric Power Engineering from High Voltage Technology to Power Electronics. The research activities are application-based and are carried out in close collaboration with NTNU. The Gas Technology Centre: The Gas Centre seeks to exploit the synergism of multidisciplinary research into the natural gas value chain. The centre is the largest natural gas research- and educational centre in Norway, located at NTNU. To increase Open Access publishing, NTNU has established a publishing fund. In 2008 NTNU's digital institutional repository was founded. The intention was to establish a full-text archive for the documentation of the scientific output of the institution, and to make as much as possible of the material available online, both nationally and internationally. In addition to the research articles and books, intended for academics and researchers both inside and outside the university, NTNU disseminates news to the public about the institution and its research and results. Universitetsavisa, which translates The University Newspaper, is the news and discussion paper of the university, available only in Norwegian. It was established in 1991. For a period it existed in both printed and digital editions, but since 2002 it is only available online. GEMINI publishes research news from NTNU and the independent research group SINTEF in both English and Norwegian. It is published in both a printed and a digital version. The Norwegian University of Science and Technology publishes the Nordic Journal of Science and Technology. According to Times Higher Education World University Rankings published in March 2017, NTNU is ranked 1st in the world ranking of universities with the biggest corporate links, due to its research collaboration with SINTEF. Statistically, 9.1 percent of NTNU's total research output is generated in collaboration with SINTEF, which is the largest academic-industry partnership in the world. NTNU was ranked 218th in the world in May 2018 in the CWTS Leiden Ranking, which is based on bibliometric indicators. NTNU was ranked 64th in Europe and 208th in the World in January 2019 in the Webometrics Ranking of World Universities for its presence on the web. Graph showing the various priority areas included in "NTNU Teaching Excellence"
NTNU specializes in technology and the natural sciences, but also offers a range of bachelor's, master's and doctoral programmes in the humanities, social sciences, economics and public and business administration, and aesthetic disciplines. The university also offers professional degree programmes in medicine, psychology, architecture, the fine arts, music, and teacher education, in addition to technology. According to the Norwegian Social Science Data Services, NTNU had 84,797 applicants in 2011 and a total student population of 19,054, of whom 9,062 were women. There were 6,193 students enrolled in the Faculty of Social Sciences and Technology Management, 3,518 students enrolled in the Faculty of Engineering Science and Technology, 3,256 students enrolled in the Faculty of Humanities, 3,090 students enrolled in the Faculty of Information Technology, Mathematics and Electrical Engineering, 2,014 students enrolled in the Faculty of Natural Sciences and Technology, 1,071 enrolled in the Faculty of Medicine, and 605 enrolled in the Faculty of Architecture and Fine Art. About 3,500 bachelor's and master's degrees are awarded each year, and more than 5,500 participate in further education programmes. NTNU has more than 300 cooperative or exchange agreements with 60 universities worldwide, and several international student exchange programmes. There are, at any given time, around 2,600 foreign students at the university. In 2015, NTNU established an initiative called ″NTNU Teaching Excellence″. NTNU welcomes students from all over the world, and offers more than 60 international master programmes as well as PhD programmes, which all are taught in English. PhD vacancies are announced on the university website and are paid as academic staff, that offers one of the world's best PhD fellowships as well as employment benefits under Norwegian law. There are no tuition fees at NTNU. However, the international students have to guarantee their living expenses if they are not offered a scholarship. NTNU students have a clear presence in the city of Trondheim. The most famous student organization is the Studentersamfundet i Trondhjem, also known as "the red round house" after its architectural form; every other year it organizes a cultural festival UKA. Another festival organized by students is the International Student Festival in Trondheim ISFiT, which awards a student peace prize and draws internationally known speakers. EMECS-thon is a student driven embedded systems marathon competition, organized by students from NTNU and implemented in some of the top universities worldwide, where participants have 48 hours to develop an embedded project from scratch. The student sports organization, NTNUI, has roughly 10 000 members in its many branches, with the largest groups including orienteering, cross-country and telemark skiing, but there are also groups for sports less common in Norway, like American football, lacrosse and aikido. A cabin and cottage organization owns several cabins in the countryside, available for students wishing to spend a few days away. There are also student fraternities, some of which conduct voluntary hazing rituals, which provide contact with potential employers and for social interaction between students. There are also alumni associations; religious and political organizations; clubs devoted to various topics such as innovation, human rights, beer, oatmeal, anime and computers; and The Association for Various Associations, which is a parody of the university's large number of student organizations. University recently started to offer "roof over your head" guarantee to the new coming student to Trondheim until they find proper housing. The Gløshaugen campus of the university has been filmed with a quadcopter and may be seen as YouTube video here. NTNU is a pioneer with of the concept of "Student Cabins", the University offers its students access to cabins on the outskirts of the city of Trondheim in which they can enjoy on vacations and weekends. In 2006, NTNU Alumni was founded, primarily as a meeting place and professional network for former students and staff of NTNU and its precursors. The network is now also open to current employees and students. In 2014 the number of members was around 30,000. NTNU annually awards honorary doctorates to scientists and others who have made an extraordinary contribution to science or culture. ^ a b c d Norwegian University of Science and Technology. "Facts and figures - NTNU". Ntnu.edu. Retrieved 2016-09-10. ^ a b "THE World University Rankings". Universities with biggest corporate links. Times Higher Education World University Rankings. Retrieved 9 March 2017. ^ "Norsk institutt for naturforskning > Aktuelt". www.nina.no. ^ Norwegian University of Science and Technology (2016-03-14). "Faculties and departments - NTNU". Ntnu.edu. Retrieved 2016-09-10. ^ Fossen, Christian. "Research". www.ntnu.edu. Retrieved 2017-07-24. ^ "Research Council of Norway. Norwegian Centres of Excellence". Research Council of Norway. Retrieved 2010-06-04. ^ "Kavli Institute for Systems Neuroscience". The Kavli Foundation. Retrieved 2010-06-04. ^ "Norwegian Prime Minister opens brain research centre at NTNU". Norwegian University of Science and Technology. Retrieved 2012-07-15. ^ Fossen, Christian. "NTNU Biotechnology". www.ntnu.edu. Retrieved 2017-07-22. ^ Fossen, Christian. "NTNU Digital". www.ntnu.edu. Retrieved 2017-07-22. ^ Fossen, Christian. "Nano@NTNU". www.ntnu.edu. Retrieved 2017-07-22. ^ Fossen, Christian. "Research Excellence". www.ntnu.edu. Retrieved 2017-07-24. ^ Fossen, Christian. "ERC-prosjekter". www.ntnu.no (in Norwegian Bokmål). Retrieved 2017-07-24. ^ Fossen, Christian. "EU projects". www.ntnu.edu. Retrieved 2017-07-24. ^ Fossen, Christian. "Bedre sammen". www.ntnu.no (in Norwegian Bokmål). Retrieved 2017-07-26. ^ Norwegian University of Science and Technology (2013-10-01). "Publishing policy - NTNU". Ntnu.edu. Retrieved 2016-09-10. ^ "Universitetsavisa". Universitetsavisa.no. Retrieved 2016-09-10. ^ "Gemini.no - Forskningsnyheter fra NTNU og SINTEF". Gemini.no. Retrieved 31 May 2015. ^ "Editorial Policies". Nordic Journal of Science and Technology. ISSN 1894-4647. Archived from the original on 11 August 2016. Retrieved 3 August 2016. Nordic Journal of Science and Technology (NJSTS) is an Open Access academic journal currently published at the Norwegian University of Science and Technology. ^ "CWTS Leiden Ranking". CWTS Leiden Ranking. Universiteit Leiden. Retrieved 16 May 2018. ^ "Norway | Ranking Web of Universities". Webometrics.info. Retrieved 31 January 2019. ^ "ShanghaiRanking's Global Ranking of Academic Subjects 2018 | Shanghai Ranking - 2018". www.shanghairanking.com. Retrieved 2018-08-15. ^ Fossen, Christian. "Teaching Excellence". www.ntnu.edu. ^ Fossen, Christian. "Vacancies - employment -- job opening". www.ntnu.edu. Retrieved 2017-07-26. ^ "Temporary housing in August". NTNU. Archived from the original on 26 June 2015. Retrieved 26 June 2015. ^ Haust @NTNU Gløshaugen. YouTube. 14 October 2013. Retrieved 31 May 2015. ^ Fossen, Christian. "Student life". www.ntnu.edu. Retrieved 2017-04-24. ^ "Studenterhytta :: NTNUI | About". www.studenterhytta.org. Retrieved 2017-04-24. ^ "John O´Keefe blir professor II ved NTNU -Universitetsavisa". Universitetsavisa.no. Retrieved 2016-09-10.